“Total freedom” is a creative cage. What people are really doing online. Steve Martin’s secret of success, and a massive (and mostly missed) opportunity on Twitter. 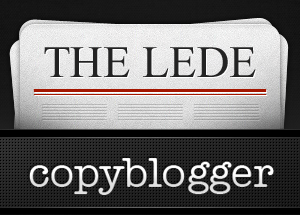 Speaking of Twitter, follow @copyblogger to grab these links – and a lot more – throughout the week. Need to Create? Get a Constraint. I once heard a Portland indie rocker say “Rules? I don’t follow rules man, music is all about freedom.” What an idiot. Immortal music — like any creative work — is all about rules. Apply the shackles to your creative thinking and watch what happens to the quality of your work. Traffic means nothing without conversion. Here are some great ways to make conversion easier. When you see the most common use of the Internet in this infographic (bottom section, left side), you’ll say “Oh man, of course.” There’s a good reason we talk again and again about this old workhorse of technology, it’s what most people use most often online. Read this article three times. Seriously. I recently surprised myself by getting rid of 99% of my physical books. I’ve decided to replace the ones that matter with eBook versions. I’m old. I’m a relative luddite and technophobe. Think about the digitally radical generations to come, and you’ll realize that extraordinary content is the only way forward. At first glance, the premise of this article seems to herald The Fall of Twitter. It actually states (implicitly) a glaring opportunity for those who use the service to thoughtfully give their audience what it’s been waiting for. Possibly my favorite Godin marketing koan. A world-class education in 232 words. Wow, EXCELLENT compilation. Will print out now. Agreed on the Seth Godin post, one of my favorites. Useful list, will try to read them all. You’re right, you do need to read the Steve Martin article more than once. I really had to spend some time on this one and let it percolate. Fantastic article, thanks for sharing that one Robert. “Be So Good They Can’t Ignore You”. Steve Martin is brilliantly funny, and so brilliant. The 10 tools – I’ve already grabbed a few for my arsenal. The No.1 use. Yes, of course. So glad you decided to start doing this. Compilation and consolidated stuff is the only thing which gives me peace of mind after going through the daily clutter of my google reader. Unfortunately I can’t give my attention to everything, this really helps cover the missed stuff. I hope you do more posts like this. I agree completely with the Seth Godin concept. Building a brand, following, tribe, team, or whatever is about building a genuine relationship, and you really can’t do that with a quick 130 characters. It needs to be over time and full of value. They should feel like they left with more value than before they arrived. All my close relationships were built over time… should that change online? Thanks for this link post. Lots of great stuff to read through. I am particuarly enjoying the post by The Content Strategist.